Over at Splitcoast, the Featured Stamped has such a beautiful gallery with many wonderful pieces of inspiration. The designer paper used is called Global Views from DeJa Views. I used Stampin’ Up! Pumpkin Pie in craft ink, then used an embossing powder from a former stamp shop here in town to emboss it. The image is called Blush and it’s from Penny Black The embossing powder is called Jasper and it’s such an interesting color! I’ll be sorry when it’s all gone! The sentiment is from the Dawn Houser line at Inkadinkado. 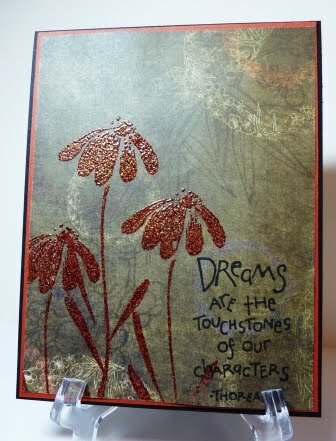 The piece of designer paper has been layered over a slightly larger piece of Stampin’ Up! Cajun Craze and then mounted on a standard A2 card base in Stampin’ Up! Basic Black. I hope all you moms out there have a beautiful Mother’s Day! We are all so blessed to be moms aren’t we? I didn't realise you had a blog now! I can see why you'd miss that EP when it's finished up – with that image it gives a wonderful oriental feel to this beautiful card.